"Rohingya Safe but Not Secure in Bangladesh". Refugees International. (জুলাই ১২, ২০১৭). Wright R. and Westcott B.. "At least 270,000 Rohingya flee Myanmar violence in 2 weeks, UN says". CNN. (সেপ্টেম্বর ৮, ২০১৭). "Turkey to Bangladesh: Open your doors to Rohingya Muslims, we'll cover all expenses". Daily Sabah. (সেপ্টেম্বর ১, ২০১৭). REUTERS. "Erdogan Says Turkey Will Send 10,000 Tonnes Aid to Myanmar's Rohingya". The New York Times. (সেপ্টেম্বর ৬, ২০১৭). Faisal Edroos. "UN: We lack the resources to handle the Rohingya crisis". Al Jazeera. (সেপ্টেম্বর ৯, ২০১৭). REUTERS. "After Insurgents' Truce, Myanmar Says 'We Don't Negotiate With Terrorists'". The New York Times. (সেপ্টেম্বর ১০, ২০১৭). 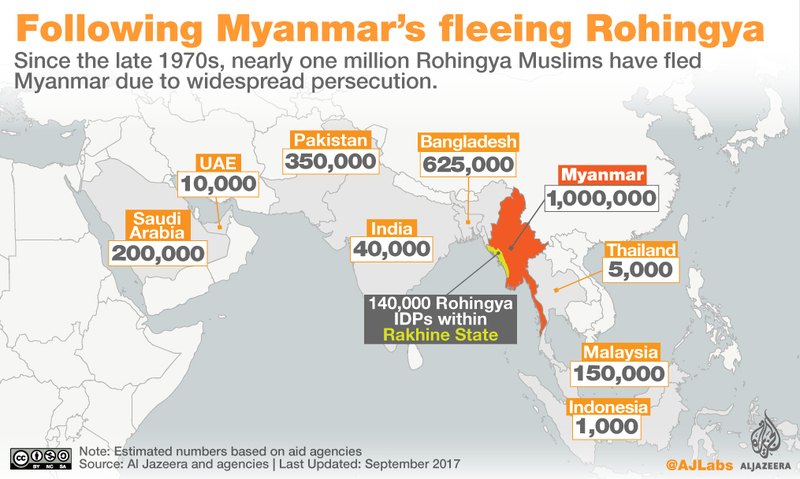 "Nearly 20,000 Rohingya flee to Bangladesh from Myanmar". Al Jazeera. (আগস্ট ৩০, ২০১৭).